Killdeer Plays Killjoy, Halts Production Of 'Canada's Coachella' The birds nest was found in the same location organizers hoped to construct the main stage of the Ottawa Bluesfest. Killdeer with two eggs, photographed in Arizona under controlled conditions. A nest discovered by organizers of the RBC Bluesfest in Ottawa, Canada has prevented them from constructing its main stage. Organizers of Ottawa's RBC Bluesfest, which describes itself as "the Canadian version of Bonnaroo, Coachella, and/or the New Orleans Jazz and Heritage festival," are refusing to separate a family of birds that has nested near its festival site, preventing the construction of its main stage. "The fact of the matter is that, without sounding righteous, we want to do the most humane thing," AJ Sauve, the festival's communications director, told NPR. The festival, which is expecting to draw 100,000 music fans from July 5-15, has received the go-ahead to relocate the eggs some time Tuesday. "We've seen it all — you name it, we've seen it," Sauve said. "This one here, this is a new one." Sauve added that he and his team have become amateur ornithologists over the past two days. "Environment and Climate Change Canada (ECCC) has issued a permit under the federal Migratory Birds Convention Act to allow the relocation of the nest to nearby suitable habitat," a spokesperson for the ECCC writes in a statement to NPR. "The Killdeer is not a species at risk although the Canadian population has seen a decline over the last 40 years. The relocation will allow the nest to remain and eggs to hatch in the natural environment. In the event of nest abandonment, eggs will be transported to a rehabilitation facility to provide the best probability for survival." In a press conference held Monday, festival director Mark Monahan stressed the need to find a compromise. "Within a week or so there's going to be 100,000 people congregating on this site," he said. "We realize that, although it may seem calm right now, it is highly unlikely that the activity level, which will be tremendous, will be conducive to the eggs or the bird continuing to be here. So we're trying to come up with a solution that's best obviously for the eggs and the birds, and also hopefully that wouldn't hamper our ability to set up and eventually put on the festival." 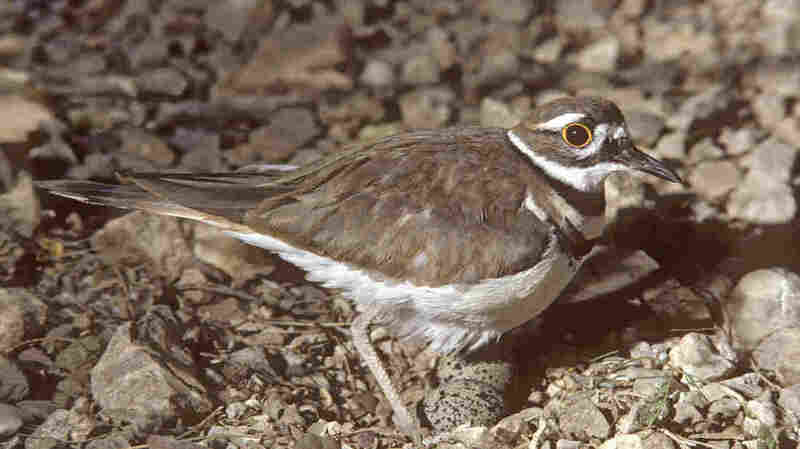 The birds are a common species called "killdeers," which is known for both its boisterous vocalizing and its "fake broken wing dance," which it uses to distract predators from its nest. Organizers hope to incubate the eggs, or move the nest to a safer location until the eggs hatch, after which the chicks — unlike, say, human beings — become relatively independent.